There are moments in life when you suddenly feel like you have been there before. Or that your current situation has happened to you almost exactly the same way at another time. It starts with an eerie sensation in the back of your mind that travels down to your neck before lodging itself right next to your frontal lobe with a lot of help from the hippocampus. This phenomenon is known as déjà vu (meaning “already seen”) and the vast majority of the population has experienced it at one point. Basically: we nearly have all been here before, and it freaks us out. But what if you are looking at something that is totally familiar, so familiar that you know you have seen it your entire life, and suddenly it looks foreign, strange, and entirely unfamiliar? Possibly, you’ve experienced that feeling before if you’ve written or said the same word over and over again. Bowl. Bowl. Bowl. Bowl. Bowl. B O W L. Bowl. Hopefully by the time you hit that last “bowl,” it started to look like a made-up word, as if whoever wrote it was crazy and couldn’t spell bowl to save his life. By the time I wrote it seven times it looked very strange to me as well. This brain anomaly is known as jamais vu (meaning “never seen”) and describes any familiar situation that is not recognized by the observer. Confusing indeed. And yet, even more common, at least for me, is the feeling that a certain idea, word, or name is on the tip of your tongue, but you just can’t quite grasp it. You might remember a letter it begins with, words it rhymes with, or what the idea has to do with. It’s the feeling of impending epiphany, looming discovery, or imminent understanding, and the subsequent frustration at being stymied by your recollection. This peculiarity of partial memory recall is called presque vu (meaning “almost seen”) and shows up at the worst of times, such as when you are in Final Jeopardy and Alex Trebek asks a question regarding your college thesis topic. All of a sudden you cannot for the life of you remember what Thomas Jefferson’s estate was called (Monticello) even though you devoted two chapters to it, including the design and construction. But, you know it starts with an m and you think it rhymes with Portobello. Darn, there goes $25,000. Oh well. I find myself dealing with this brain blunder most specifically when trying to list off things that I have great interest in, like, say, different references of my favorite watch brands. For some reason I will know that I have half a dozen favorites from a brand, but when I try to say them out loud I’m lucky if I can name one. Maybe there is just too much awesome floating around in my brain that trying to narrow it down to a single point of awesome causes it to get stuck like a broken record. So when I was looking over the 2014 Grand Prix d’Horlogerie de Genève’s pre-selected watches and remembering why I loved what I loved, and what else of those brands I loved, I had a very strong and lingering feeling of presque vu. Breguet has always held a special place in my heart; it is the most classic of the classique, and in many ways the most traditional you can get without being Roger W. Smith. I appreciate Breguet for this and many of its pieces as well. Breguet had six pre-selected timepieces in the competition, and each one reminded me why this brand is on my “it” list. But I knew there was more, I just couldn’t put my finger on it. I knew there is a watch in the collection that I was in love with, that I had described in my past as one of my top-ten, all-time faves, but I could not, regardless of my mental effort, remember what it was called (or more specifically, remember the reference number). After a bit of head scratching I remembered a tish of detail: it had a fusée and chain! 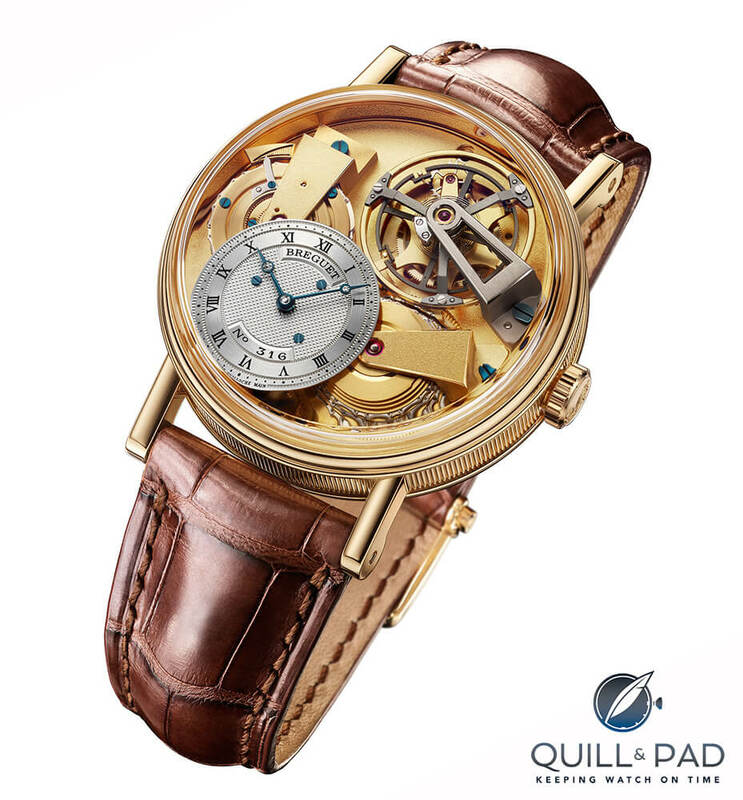 From there, with a little bit of help from my friend Google, I was able to track down the object of my affections that my brain had temporarily decided it didn’t need to recall accurately: the Breguet Tradition 7047 Fusée Tourbillon. The Tradition Fusée Tourbillon is the most incredible modern Breguet that I have seen. Period. I make no claims as to its innovation, its complexity, or its everyday wearability. I simply make the claim that if you wanted a true Breguet with all of the brand’s history rolled into one timepiece, the 7047 is the piece for you. The Tradition Fusée Tourbillon is simply dazzling in its legendary style and haute horology mechanics. First off, there is something that many people don’t realize was invented not by clock makers, but by engineers long before: the fusée and chain. This device is not only one of the simplest solutions for incredibly complex problems introduced by crude metallurgy and rough fabrication, but it also happens to be a highly sought-after mechanism in antique pocket watches. I was able to purchase a non-working example (a” someday” project) that was built in the early 1850s by David Taylor of Liverpool, which holds an honored position in my collection. The fusée is a device that corrects for the imperfect torque curve of a mainspring (which was horrendously variable with early metal springs) by allowing the slowly diminishing average torque to be applied smoothly and in the same ratio over the entire length of the mainspring’s power reserve. While it was crucial to early pocket watches, the fusée’s purported advantage in the modern age would be to add to the overall accuracy and consistency of a timepiece using modern springs (which now have a relatively flat torque curve). A ridiculously tiny chain wrapped around a hyperboloid cone and attached to a mainspring barrel assembly sporting a small and elegant power reserve scale: this is only the beginning with the Tradition Fusée Tourbillon. Moving on, we come to the second bit of perfectly classic Breguet, the titanium one-minute tourbillon with silicon hairspring. But I’m sure you saw that whirlwind coming, I mean it was right there in the name. The application and implementation of the tourbillon is where the magic lies. A very large 17 mm titanium tourbillon carriage carries a 13 mm titanium balance wheel, all supported by a titanium bridge. Helping the balance to oscillate is a silicon balance spring with a Breguet terminal curve, whose production is less than straightforward compared to a standard silicon balance spring. All together, these components make for a very modern and high-tech twenty-first-century version of Breguet’s own nineteenth-century invention. After all of this you have the amazingly clean design straight out of a historic watchmaker’s studio including purpose-built bridges that do their job with stability and grace. Decoration isn’t needed for a mainspring bridge or a fourth wheel bridge. “Classic” takes on its true meaning when discussing this movement design and construction. Solid and no-nonsense, just like you would find on any great timepiece from three hundred years ago. The dial, while small, still has the same classic flair of all of Breguet’s pieces. A black-coated, solid 18-karat gold dial that has been meticulously hand-guilloche on a rose engine. This technique is itself a classic art that is preserved by a few brands, with Breguet being the frontrunner in engine-turned dials. Just another aspect that makes a Breguet a Breguet. But, wait, I almost forgot about the most surprising aspect of the whole thing, the ginormous domed sapphire crystal. The crystal bulges out from the case by 3.6 mm and creates an observatory for the glorious movement inside. This allows for the visual thickness of the case to remain fairly trim while the movement rises out from the golden depths and towers with its bridges and fusée components. I have to say that in more modern vintage watches I do love the look of the domed acrylic crystals, but don’t like the fact that they scratch at a moment’s notice. With this you get the best of both worlds and a view of that tourbillon from almost every angle. This watch simply tickles my fancy and is everything I would want a classic watch to be, while also happening to be a very modern timepiece along the way. It surprises me that I could possibly have a moment of presque vu and forget which model this was and what I liked about it. I guess that’s the curse of liking so many different pieces! But I don’t think I will be forgetting this one any time soon, it is imprinting itself onto my memory as we speak (at least I hope so). In case I have a breakdown from trying to remember all these pieces, let’s get to this breakdown! • Wowza Factor * 9.82 The most classic and modern of Breguet in one watch. That is what wows me. • Late Night Lust Appeal * 105.33 » 1,032.934m/s2 At this force you might as well never try to get up, because this baby is keeping you in your seat for a long time! • M.G.R. * 70.1 Breguet Caliber 569 with fusée and titanium tourbillon. Words cannot do justice what they eyes take for granted. • Added-Functionitis * Slight This watch is the first with an added function following a long line of time-only watches I have written about. It has a handy power reserve, but that is it. So I guess children’s strength Gotta–HAVE-That cream will suffice for now. • Mermaid Moment * The Moment You Remember! Presque vu will set the stage for the greatest romance of our time. With a watch. Better call the florist. • Awesome Total * 569 For me it’s all about that movement, so let the total reflect the movement number, that incredible movement number. For more information, please visit www.breguet.com.